Educated Russians returning from the front found it particularly hard dealing with the disparity between the kind of work they had done in Russia and the prospects facing them in their adopted country. 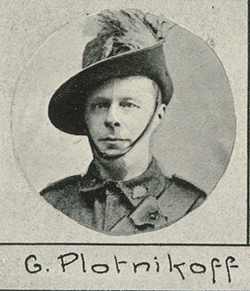 George Plotnikoff, one of those who had briefly worked with the Russian government committee in London before returning to Australia, was in his forties; a former civil engineer from Siberia, he had 'finished his course in a Russian Technical School, and had a long experience in technical work'. 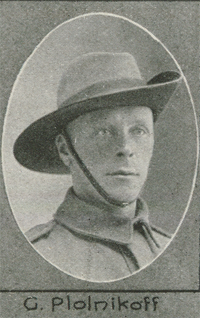 He was a Gallipoli veteran and had been severely wounded at Pozières but, back in Australia, he re-enlisted in the AIF in April 1918 -- probably because he was unable to find work. During his second period of service his vision deteriorated and, when he was discharged, he found himself in a desperate situation. The King and Empire Alliance tried to help him and wrote to the minister for Repatriation in January 1920: 'He was offered a position by the Repatriation Department on a contract for wood cutting but as his injuries received in the war were of such a nature he could not accept the position -- his sustenance was thereupon cut out. ... He now finds himself in the position of being again without food or even a place to sleep at nights and matters look very black indeed for him in the future as on account of the Bolshevik rising in Queensland last year nobody will employ a Russian even although he be a loyal one as this man undoubtedly is.' The department responded by saying: 'This man has received every consideration and assistance from this Department and has never been satisfied with what he received. ... It is recognized that he wants money, not work, and evinces no desire to help himself.' And yet Plotnikoff did make attempts to help himself: following his discharge, he had applied for vocational training in building construction at the Rockhampton Technical College, but the course was not run. He applied for a permit to return to Siberia, where he believed he would 'immediately find employment at his own trade -- that of a Civil Engineer'; but that was refused. What the department offered him instead was 'axe, rail fare, tent and fly, blankets' to go as a labourer to Stanthorpe and then as a farm-hand to Cecil Plains, in Queensland. He did not appreciate this offer and finally, in 1923, left for Russia.